There comes a point in your life that you have to put yourself first. 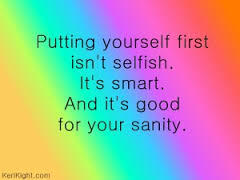 I don’t mean this in the selfish terms of thinking of only yourself and focusing only on yourself but more so in putting yourself first so that you can better yourself. Eliminate toxic people that surround you, eliminate as much stress as is in your control. If you can eliminate debt, do it! If you can eliminate bad eating habits, poor nutrition and lack of exercise then do it! Making positive choices in your life will not only better yourself but will also better others, especially your child(ren) if you are a parent. Learning to make positive decisions is a life skill it of itself. For me it’s a life skill that I am now slowing adapting. I am responsible for the outcome of my life and that of my children. Every decision that I make will have a direct affect on my children. Even though I have been a parent for over ten years already I feel like this has finally dawned on me. “Oh my gosh!! I have two little children that I am responsible for”. It is an overwhelming realization. In talking with one of my good friends this past week I was able to take a further step in the thought process of this. There are some people out there that take control of their lives at such an early age. You know the type. They go away to school, travel, and jump different careers, experience life, experience different people. They mold and create their lives, they don’t follow the mainstream, the “expectations” that society has placed on them. Instead they set their own goals, follow their own dreams and walk to the beat of their own drum. Not all of us know this at an early age. Some of us take longer to understand this and develop the skill that allows us to make good decisions for our lives. Sometimes it looks like we’ve made good decisions but in reality we were simply following someone else’s hopes and dreams for us and trying to live up to their expectations. It will take these individuals a few falls to learn how to stand on their own and make their own decisions and mold their own lives. It’s life. Every life is different. Every path is different. Sometimes we stay on path. Other times we go off path. Sometimes we stand. Other times we fall. But in reality it’s all in how we learn and grow. This week I’ve had to make decisions in recognizing that I need to put myself first. Put myself first in terms of taking care of my lifelong obligation to bond and provide love and security for my children, to come to terms with the fact that my life is not a living testament of what I wish it ideally would be but that doesn’t mean that it won’t be. Sometimes the hardest decision is the decision to put yourself first. To know that you deserve time to focus on self growth and self development and that there is nothing wrong with that. None of us can predict the future. We can’t know for sure how things will fold out but we owe it to ourselves to take a huge TIMEOUT when we have gone off course. If we can’t focus on bettering ourselves then we can’t be our best for others and I for one want to be the best of me for myself, my children, friends and family and for all of society. More importantly I want to be a better me for God. I encourage you all to take the time to ask yourself if you are in reality putting yourself first.